A bonus three-fer in this event! A culinary adventure (1) to one of the best American food cities, New Orleans (2), for the (3)! This means you get to eat AND drink your way tbrough NOLA – and what could be better than that? Mark your calendars and book your plane tickets for July 18-22, 2007 for this year’s Tales of the Cocktail, a culinary and cocktail festival, allows the connoisseur or amateur to fully experience (taste, see and learn about) cocktail culture in New Orleans and around the world. The event’s annual components are Spirited Dinners, a Seminar Series, Cocktail Hour, Cocktail Luncheons, walking tours of the French Quarter, and classic and contemporary cocktail parties -- all presented by the country’s hottest chefs, authors, bartenders and cocktail experts. Tales of the Cocktail has “shaken and stirred” the New Orleans French Quarter since 2003 and celebrates its 5th anniversary in July 2007. The list of authors, mixologists and chefs that will be on hand are too numerous to mention, although you can check them out here. Tickets are required for Tales of the Cocktail and can be purchased online or by calling 1-888-29909494. I f you are traveling to or live in the Chicago Area, we have an event coming up on June 9th and 10th. Join contributor Helen Gallagher at the Illinois Women's Press Assn. Booth at the 23rd Annual Chicago Tribune Printer's Row Book Fair, the largest Midwest free outdoor literary event. The streets will be packed with over 150 vendors of new, used, and antiquarian books, as well as author events, workshops, and food, glorious Chicago food. On the Menu is a tour operator organizing “holidays for people who love food.” This UK-based company, run by Rosemary Shrager, one of Britain’s best loved chefs and TV personalities, offers some great tours to world destinations, from the typical France, Italy, and Thailand to the more exotic Indonesia, Morocco, and Jordan, with points in between. Tours include hands-on classes, as well as cultural activities; teachers range from gourmet chefs to village grandmothers with more years of experience than you have been alive; accommodations include luxurious hotels and rustic villas. On the Menu offers tours year round, with many destinations having weekly departures. Many of the courses are suitable for vegetarians. Below is a complete list of destinations, with length of stay and cost (in British pounds). Airfare is excluded. 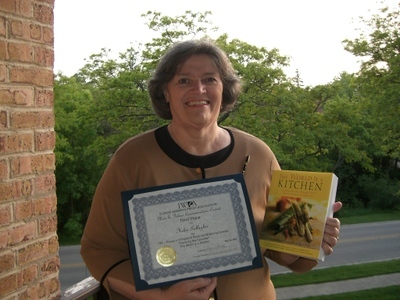 The World Is a Kitchen contributor Helen Gallagher recently won Third Place in the Illinois Womens Press Association Essay Contest for her story "Flavor by the Spoonful." The award was judged on the essay's fit with the overall theme of the book. 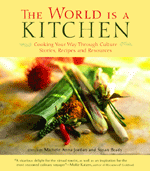 The Judge, a PR executive and Illinois bookshop owner, expressed pleasure with The World Is a Kitchen overall, so Helen generously shares this award with the editors, Susan and Michele, as well as all of the contributors. Judge's comments about The World Is a Kitchen: "Thoroughly enjoyed the lively selections. The editors' choices were completely engaging and shared a true taste of the world. I plan on carrying this title in my bookstore." Last year I took my first cruise and enjoyed every minute of it. It was the perfect antidote to the stress of everyday life: get up when you want, go to sleep when you want, eat whenever and whatever you want. Go to the movies, play bingo, sit by the pool take an excursion, or do absolutely nothing at all. I would happily go cruising on a regular basis, and am very tempted by the Regent/Seven Seas Cruises which are offering culinary adventures in conjunction with Le Cordon Bleu. Departs Dover, England with stops in St. Malo, Bordeaux, Bilbao, Lisb on, Cadiz, Barcelona and Monte Carlo. Departs Seward, Alaska with stops in Kodiak, Petropavlovsk, Hakodate, Sendai, Yokohama, and Osaka. Departs Singapore, with stops in Semarang, Bali, Komodo, Darwin, Cooktown, Cairns, Hardy Reef, Hamilton Cove and Sydney. Departs Auckland, with stops in Bay of Islands, Rarotonga, Bora Bora, Moorea, Pepeete, Nuku Hiva, and Los Angeles. Want to learn to make a tajine? Tour a souk? Dip into a bowl of couscous with your hands? Then the “Tastes of Morroco” tour may be the ticket for you. Gourmet on Tour offers culinary adventures around the world, including a magical 8-day tour that takes you to Marrakech and into the Atlas Mountains. The tour is based out of Dar Liqama, just outside of the famed old city of Marrakech. Your accommodations are in an 8-room boutique villa situated in a grove of over 150,000 palm trees that offers swimming pools, a hammam, spa, tennis, and great food. You will experience eight hands-on cooking lessons with expert chefs during your week’s stay, trips and tours of the souk in the Marrakech medina, Berber villages, Koutoubia Minaret, and Jardin Majorelle complete the experience. fresh and local cuisine every day. * Wine and our infamous raki...in moderation. The Italian jewel city of Lecce and the surrounding region of Puglia is the latest culinary destination organized by Tour de Forks, the group well known for its Sicilian and Australian food tours. Puglia is an historic and culinary gem far from the crowds, in the heel of the boot of Italy. The seven-day tour from September 3-10, 2007, highlights this region’s landscape dominated by vineyards and olive trees; its architecture covered in baroque ornamentation; the magical cone-shaped houses called “Trulli”; and especially, its famous cuisine, a simple, fresh, flavor-packed Italian taste experience unique to this region. Tour leaders are Michele Scicolone, food writer and author of 6 Italian cookbooks, including The Sopranos Family Cookbook; 1,000 Italian Recipes; and Savoring Italy: Recipes and Reflections on Italian Cooking, and her husband, Charles Scicolone, wine director for New York’s famed I Trulli and Centovini restaurants. If you are traveling to or live in the Chicago Area, we have an event coming up on April 15th. Forget about preparing those taxes, get on out of the house and down to the Glenview Public Library and share some stories with contributor Helen Gallagher, who will join other local authors in celebrating National Library Week. Available at your local independent bookstore, or through your favorite online bookseller.